I’m Forgetting… Is This A Problem Or A Part Of Normal Aging? Do you find yourself forgetting things lately? Ever walk into a room and can’t remember what you came there for? Have difficulty finding where you parked your car in the mall parking lot? Thought maybe you might be experiencing the beginning stages of Alzheimer’s disease? Normal memory loss is referred to as age-associated memory impairment, or benign memory loss due to aging. It does not affect our social or intellectual functioning. Memory loss that disrupts everyday life is not part of the normal aging process. It is a symptom of dementia, a gradual and progressive decline in memory, thinking and reasoning skills. Early symptoms of Alzheimer’s disease often include recent memory loss which may cause difficulty in performing familiar tasks such as handling the checkbook or preparing meals, difficulty learning new tasks, loss of a sense of time and problems with language. Before a diagnosis is made, other conditions must be excluded, some of which are potentially reversible. Do not assume that you or someone you love has Alzheimer’s disease. Instead, pursue a thorough evaluation, involving physical, neurological, psychological and psychiatric examinations and laboratory studies which should yield a fairly accurate diagnosis. Arden Courts Memory Care Community is a memory care community specializing exclusively in caring for individuals living with Alzheimer’s disease and related dementias. 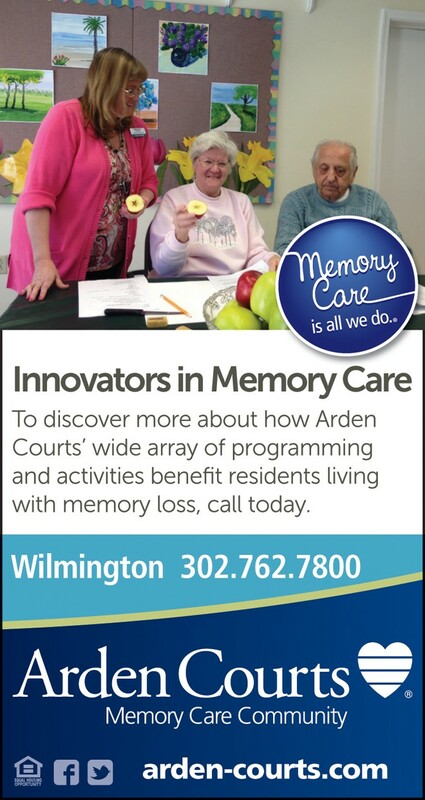 For more information about memory loss or to schedule a visit to speak with an Arden Courts professional, call (302) 762-7800. Excerpts of this article have been cited from materials from the Alzheimer’s Association. Next Story → It’s The Most (Of The Time) Wonderful Time Of The Year!